In large bowl, mix cream of chicken soup, milk and seasonings. Stir in frozen veggies (do NOT thaw in advance) and chopped chicken. Pour filling into bottom pie crust. Invert second pie crust (slightly thawed) over top of the filling. Slit top for ventilation. 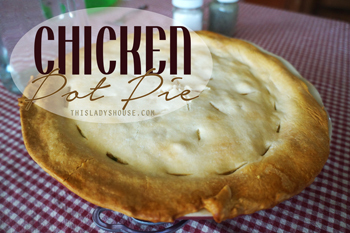 Place pie on rimmed, foil-lined baking pan. Bake for 40-45 minutes, until top crust is golden brown. This entry was posted in Recipe and tagged Dinner, Food Storage, Poultry.